RFK Action Front: Is "free market" economics even based on economics? Is "free market" economics even based on economics? The NY Times is out with a stunning article today on how the government of Malawi defied the experts and came up with an anti-poverty program that works. It's stunning because the solution was so simple -- the government of Malawi simply subsidized fertilizer so that farmers would have higher yields for their crops. 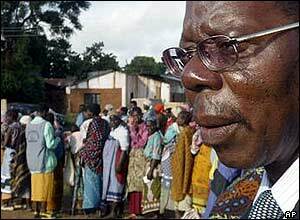 In 2005, almost 5 million of Malawi's 13 million people needed emergency food aid. This year, Malawi is a net food EXPORTER selling corn to the World Food Program and the United Nations. The truth is that every major industrialized nation subsidizes their farmers (and those farmers in turn go out and buy seed and fertilizer with the money). But for decades U.S. and British development "experts" advising African nations AGAINST subsidizing agriculture. "In the 1980s and again in the 1990s, the World Bank pushed Malawi to eliminate fertilizer subsidies entirely." The U.S. (University-of-Chicago-Milton-Friedman-inspired) "logic" was that government intervention would interfere with free market solutions to the problem. The reality was that this theory caused millions of actual human beings to starve to death. Malawi's paid $74 million to subsidize fertilizer this year but it returned an estimated $120 million to $140 million in crops produced -- that's a pretty good return on investment. Simple freakin economics -- but a strategy the World Bank and IMF opposed for years. So here's my question: was University of Chicago free market economics ever actually based on economics? Yeah, I know there were probably equations involved showing how it'll all work out and calculus was probably used and fancy graphs were produced. But WHEN IT NEVER ACTUALLY WORKS OUT THAT WAY IN THE REAL WORLD what are we to make of it? Are we just supposed to shrug our shoulders and say, "stuff happens" or is something more sinister going on here? Because when you look at it, white male 1st world insistence on pulling oneself up by one's bootstraps and hatred of dependency -- looks a lot more like personal preference (or religious doctrine or eugenics or racism) and a lot less like economics. The 1st world has been telling poor brown people in the 3rd world that they are lazy for centuries. Slave owners tried to justify slavery as being good for the slave because it would instill a Protestant work ethic in ("otherwise lazy") people. Same thing with colonialism. Now with neocolonialism we are seeing the same goddamn argument -- isn't it about time we all called BS on this tool for exploitation? Let me put it a different way: When Nazis put signs over the gates of concentration camps that read, "Work Shall Set You Free" nobody actually saw the concentration camps as job training programs to instill discipline. Non-insane people recognized it as a sickening symptom of a pathological culture. So when the World Bank tells (actually, forces) starving nations NOT to subsidize agriculture -- even when it's been shown to work -- do we see that as simply economists who know best, or do we see it as pathological, cruel, and even criminal? If the World Bank recommends policies that cause millions of people to starve isn't that in fact, a crime against humanity? One day will we have war crimes trials where we put World Bank, IMF, and WTO officials on trial for the crime of genocide? So for ignoring the experts and feeding his people, we name Malawi's President, Bingu wa Mutharika, the RFK Action Front Person of the Week! In the comments, Beth wisely notes that this is really a riff on themes brought up by Naomi Klein in her book Shock Doctrine which I wrote about (here) and (here). If you have a chance, do check out the book. Great post today, Toby. Where's the link your previous post about "Shock Doctrine"? I'd like to see that. Also, I'd love to see you name a "Person of the Week" each week. What if Google ran the whole country?